To ensure floor tape lasts for years, proper installation is vital. Create a plan for where the tape will be installed and who will install it. It may be a good idea to have two or more people do the actual installation if you plan to apply long segments of tape. Keeping long sections of tape straight and applying them evenly can be challenging for one person. Before you apply any tape, you must prepare the floor. First, remove any old tape or paint. Never place new tape on top of old markings, as these can cause your new tape to peel. Next, prepare the floor by sweeping up dust and debris. Wash the floor with a cleanser that does not have chlorine or citrus in it, as these can leave a residue on the floor. Dry the floor using fans or allow it to air dry overnight. If you let the floor air dry, do a visual inspection the next morning to make sure there are no wet spots and that no new debris has entered the area. To prevent people from walking through the area and re-contaminating the floor, it is best to do floor tape installation over a weekend or other time when few people will be working nearby. Once the floors are clean and dry, you can begin installing your tape. If you will be installing a piece of tape over a long distance, use a chalk or laser line to create a straight guide for you to follow. Unroll the tape over your guide line and make sure the liner on the sticky side of the tape does not come loose. Once you’ve unrolled the tape to the desired length, cut it straight across using a razor or sharp scissors. Now, remove the liner from the beginning of your tape. Place the tape on the floor where you want it to start with the guide line in its exact center. Press the tape to the floor and tack it down. Slowly move down the line of tape and remove the liner as you go. Gently tack the tape down every few feet to ensure it stays in place. Do not stretch or pull the tape. Once you’ve pressed the tape all the way down the line, walk ‘heel to toe’ along the line to make sure the adhesive sticks to the floor. Floor tape requires at least 250 pounds of weight to create a final bond with the floor, so you should also run a tamper cart down the line or drive a hi-low along the length of the tape. You can immediately begin walking on the tape. After 24 hours, the tape will have fully bonded with the floor and will be ready for heavy traffic. Before opening the area up to normal traffic, though, inspect the tape to make sure it has evenly adhered to the floor. Clean your floor tape regularly to extend the product’s life and ensure visibility. Mop the tape as you would the rest of your floors. Don’t leave the tape in a puddle of water, as doing so can weaken the adhesive over time. When cleaning the floor tape, check for signs of wear. If you see spots starting to bubble up, apply weight to them so those areas re-adhere to the floor. Cut off small sections that tear or peel up to prevent the entire piece of tape from peeling. If there is a significant tear or peeling problem, it may be necessary to pull a small section of the tape up and put down new tape. Take care of your tape as much as possible. Avoid hammering on the tape with tools or vehicles. Don’t drag heavy, non-wheeled items across the edges of the tape. Over time, doing so will damage the tape. If you use a forklift, do not press the forks down near the tape and move the vehicle. The lowered forks could scrape the tape and cause tearing. Drivers should also avoid turning the vehicle’s wheels while on the tape, braking on the tape or accelerating on the tape. These actions can put pressure on the tape and cause it to age prematurely. Instead, brake and accelerate slowly if safety dictates you must perform either of these actions near floor tape. In general,it is best to avoid doing loading and unloading with forklifts near floor tape. 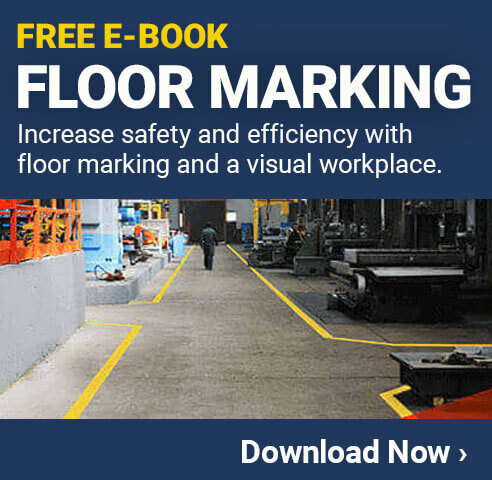 Train everyone in the facility so they know how to perform their day-to-day tasks without damaging the floor tape. Send out a flyer or include a brief talk about best practices at a company meeting. When everyone follows instructions, floor tape will last longer, stay visible and help create a safer work environment. Previous post What is Fault Current?